2004; 394 pages. Book #33 in the Discworld series. Awards : nominated for the Nebula and Locus Awards in 2005. Genre : Fantasy. Overall Rating : A-. Condemned to be hanged by the neck until dead (and in fact, done so), con-man extraordinaire Moist von Lipwig is made an offer he can't refuse - become Ankh-Morpork's postmaster general. The alternative is to jump (or be pushed) from an incredibly high tower, and hope that angels catch him. Moist chooses the more terrestial alternative. Alas, the postal system is in disarray, being viewed as obsolete now that the clacks system (think giant semaphore towers) have been built. It is going to require all of Moist's effort and ingenuity to turn the business around. A good storyline and some good themes. There's the sorry state of the postal system, of course. The clack towers are the equivalent of our modern-day Internet and e-mail (bigger, faster, and prone to meltdowns), and at least in this book Pratchett's sympathies are with the Post Office. But Pratchett also dwells upon shady and asset-less business dealings. And gives some insight on why people fall for scams. Going Postal marks the debut of Moist von Lipwig. Besides him, the book also showcases Lord Havelock Vetinari, the ruler of Ankh-Morpork and self-professed tyrant. Pratchett presents both in a rather favorable light, which is a nice literary change. Moist gradually finds the Post Office a more-satisfying career than swindling people out of their money. And Vetinari may be a tyrant, but he does look out for the welfare of Ankh-Morpork, albeit while employing some highly effective assassins and spies. Being a recent Discworld book, Going Postal focuses more on the story, and less on groan-inducing puns and mangled metaphors. I've made my peace with Pratchett on that issue. Going Postal is especially recommended if you value interesting plotlines over plentiful wit. I think this is as good as it gets for recent Discworld books, so we'll give it an A-, particularly if you're looking for a "light read". The Locus and Nebula Award people agree. Moist von Lipwig is a seriously awesome name. I've read zero of Pratchett's stuff. I must remedy that soon. 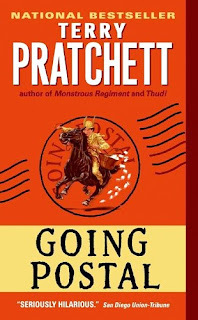 if you like the storylines in the Stephanie Plum books, you'll probably like recent Discworld books like Going Postal. Nothing real deep or complex, but good dialogue and witty insight. No romance though. Which some of us deem to be a plus. Well okay, there was one Discworld book - Guards! Guards! -that had some romance in it. Well, some courtship anyways. But none of that kissy-kissy mush-mush stuff. I love Discworld, especially after the fifth or sixth book. Going Postal is a favorite, especially the opening scene with the hanging. Nihil, did you find Pratchett refining his style over the course of Discworld? I'm not reading them in order. The early ones seem to be punnier and more light-hearted. The later ones seem to have better-developed stories, but not quite as much wordplay. I can't say one style is better than the other. Just different.